Tuesday Anderson sits down with President Obama at the White House to talk about a range of issues. The economy naturally will be a big focus. Fifteen days into his presidency, Mister Obama is pressing Congress hard to have a stimulus bill on his desk by mid-month. Meantime, the dismal economic news keeps coming. Every day it seems, more companies announce more job cuts, and economists tell us another facet of the economy has hit either another all-time low (or high, when low is the goal). As the Senate takes up its version of the stimulus bill, the president is getting more pushback from Republicans. Still, Mister Obama has been playing down what he calls "modest differences" between Democratic and Republican lawmakers. The House, as you know, passed its $819 billion version of the economic stimulus package last week. The near-$900 billion package before the Senate is very similar to the House bill, with a few key differences: The Senate bill adds $70 billion in Alternative Minimum Tax relief for working families and $17 billion to give $300 payments to seniors, disabled people and others who can't work. It also would suspend taxes on unemployment benefits. 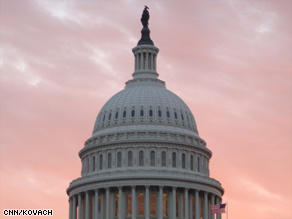 Those differences will likely balloon as Senate takes up a number of amendments, including proposals to expand infrastructure spending, lock in low mortgage rates and expand a homebuyers' tax credit. When Anderson sits down face-to-face with President Obama, there will be plenty to talk about. What would you ask President Obama if you could switch places with Anderson? Let us know what's on your mind. We'll have Anderson's full interview with the president at 10 pm ET on 360. Senate Democrats have dropped two controversial spending programs in the Senate economic stimulus bill: $75 million dollars for anti-smoking programs, and $400 million for STD and HIV prevention. Two Democratic leadership sources tell CNN Monday Democrats did it as a “symbolic gesture” to show Republicans they are listening to their objections. Republicans, and even some Democrats, have been pointing to both of these items as prime examples of “excess spending” that doesn’t belong in this stimulus bill. But there are, of course, many other programs that Republican senators, and even some conservative Democrats still want to scrub from the bill. President Obama remembers "the ladies"
President Barack Obama signs the Lily Ledbetter Fair Pay Act. Barack Obama has been fighting for women’s rights ever since his days as a state legislator. So, it is fitting that the first bill he signed into law was the Lily Ledbetter Fair Pay Act. The law will give workers more time to take their cases to court for equal pay and reverses a United States Supreme Court decision that limited Ms. Ledbetter’s ability to sue after she discovered that Goodyear had been paying higher salaries to her male counterparts for nearly 20 years. So this was a good day for women of all racial and ethnic backgrounds, young women, older women, women with disabilities — and their families. As Michelle Obama noted, this law is especially important at a time when so many families are facing economic hardship. For her part, Mrs. Obama leaves behind a legal career to serve her country in a new capacity; but in this new century she can carve out a new role for the First Lady. Think of all the first ladies who have come before: Abigail Adams who was her husband’s chief counselor. Eleanor Roosevelt who pushed for women’s liberation long before the term existed. And of course, Hillary Clinton the first former first lady to serve as Secretary of State. Abigail famously wrote to her husband John: “Remember the ladies, and be more generous and favorable to them than your ancestors.” As he put pen to paper, President Obama did just that. 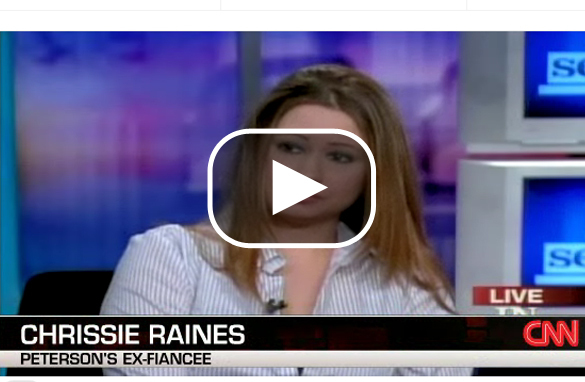 Watch as In Session's Lisa Bloom interviews Drew Peterson's ex, Chrissy Raines. 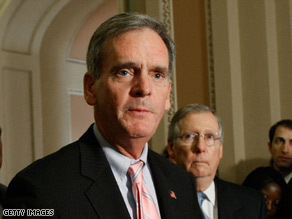 Sources tell CNN Sen. Judd Gregg will be President Barack Obama's choice for commerce secretary. This just in... Republican Sen. Judd Gregg of New Hampshire has accepted President Barack Obama's offer to be commerce secretary. We're told the official announcement should come tomorrow morning. Gregg wasn't Pres. Obama's first pick. You may recall, New Mexico Gov. Bill Richardson was nominated to head the Commerce Department, but he withdrew his name from consideration because of a federal investigation involving state government contracts. Gregg would be the third Republican in the Obama cabinet. Two others are Defense Secretary Robert Gates, a holdover from the Bush administration and Transportation Secretary Ray LaHood, a former Illinois congressman. This is an interesting pick. If Gregg is approved for the job, New Hampshire's Democratic governor would appoint a replacement. That could give Democrats the 60-seat majority needed to overcome Republican attempts to use filibusters to block legislation. Do you think the Dems will hit that "magic number"? Or did Gregg tell Pres. Obama he'd only take the new post if a Republican got his seat in the Senate? We'll talk it over in a Strategy Session with our political panel. And,Bank of America is under fire for funding a massive Super Bowl event - the "NFL Experience." Yep, that's right, Bank of America, the same bank that bought Merrill Lynch and got a $45 billion dollar federal taxpayer bailout to stay in business itself, sponsored the five-day interactive sports game extravaganza. Bank of America insists it was worth it to sponsor the event. Tom Foreman is Keeping them Honest and we'll have their side of the story. We'd love to know what you think of the deal. Share your thoughts below. And, we have a 360° follow on the California octuplets. Today they turned one week old. We'll talk about the medical progress with CNN Chief Medical Correspondent Dr. Sanjay Gupta. But what a lot of people are talking about is the Mom's dream career. She wants to be a childcare expert on TV. The L.A. Times reports she was once a psychiatric technician, then stopped working after she was injured on the job. She then became a student, the paper says, and started having babies. Lots of them! She already has six children at home. She'll have her hands full with 14 kids. We'll have these stories and more tonight on AC360°. 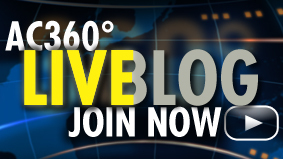 Join us at 10pm ET. Shortly after 5pm, Tom Daschle walked into the Senate Finance Committee’s suite of offices in the non-descript Dirksen Senate building. Committee staff had just begun briefing Daschle’s former colleagues in the anteroom, about the investigation they had been conducting for a month about his failure to pay $128,000 in taxes – mostly for a car and driver he used for three years. 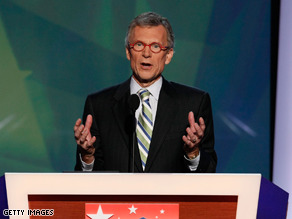 Daschle waited in the room next door. Any other nominee may have been sitting nervously as the Senators deliberated over the controversy that will decide his fate. According to a source in the room, the former Senate Majority leader spent some time catching up with his old friends, even sharing pictures with Chuck Schumer of New York, while he waited. But it turns out that almost all the Democrats on the committee had already decided they would stand with their former leader. 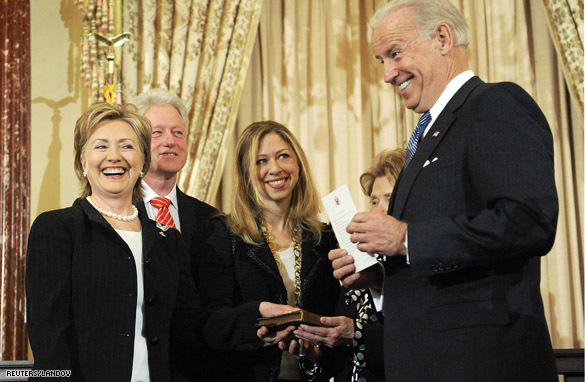 U.S. Vice President Joe Biden holds up his notes as he prepares to ceremonially swear-in US Secretary of State Hillary Clinton, who is joined by her husband former US President Bill Clinton and daughter Chelsea Clinton at the State Department in Washington, February 2, 2009. Yesterday, on the Sunday talk shows, Democrats unveiled their new stimulus talking point. 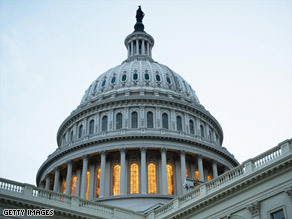 The Democratically-led House may have added unnecessary, interest group spending, but "The Senate" (unfurl the flags and blare the trumpets here) is where legislation goes to be improved upon by the gray-haired wise men and women of the greatest deliberative body. In my three years working for then Senate Majority Leader Bill Frist, I recalled pitched battles where Senators of both parties attempted to lard up bills with unrelated and, often times, unnecessary spending. Remember the Bridge to Nowhere? That boondoggle came to you via Alaska's Senator Ted Stevens. My former boss even urged the President to threaten a veto on the emergency Katrina relief bill back in 2006 because Senators were going hogwild. In fact, the Republican-led House bill totaled less than the President's request, while the Senate version exceeded it by $14.4 billion. Some extraneous items managed to get cut like $15 million for seafood promotion and $1million for a study of Hawaiian dams and reservoirs. But Senators did not show superior restraint to their House counterparts. My former boss, it should be said, did, and voted against the lard-ridden legislation. I called my former colleague, Marty Gold, the unofficial dean of the Senate who teaches incoming Senators the legislative ropes, and who has literally written the text book on Senate procedure. I asked him what he thought about the new Democratic talking point on the upcoming Senate debate. He was elegant, but blunt. "It's not that the Senators are inherently more politically mature. They're cut from the same the cloth, but are operating in chambers where different rules apply. Once you get into these pork barrel emergency bills, then the normal deliberative process goes out the window. It's their natural instinct to do that." So who puts the brakes on? "If the idea is that the Senate is a break on the House, it requires a filibuster sustaining minority. You need a Senate minority that has sufficient power, or a White House veto. In this case, the President is not likely to apply the brakes. If he gets a bipartisan bill, it will be because bipartisanship was forced by the rules of the chamber. Senate Democrats are dealing because they have to deal. If they didn't, you'd see the same interest groups. Look, many of the same Senators came from the House." And as for President Obama's overtures to Republicans? The Super Bowl watch party, and paying the Republican caucus a visit. Marty points out that it's smart politics. "A bipartisan vote helps to neutralize Republicans. And if they resist his overtures, it makes them look small. He can say he tried and got the back of the hand. He has every incentive to reach out." And one last thing, Marty pointed out that if you give the Democratic majority what they really want - a filibuster-proof majority - today's talk of sober bipartisanship will be a quaint and distant memory. Without the political restraint of a potential filibuster, the restraints on the majority evaporate. So, Norm, if you're reading this blog out there in Minnesota, Senate Republicans are counting on you to keep up the fight. And Judd, get that Senate seat deal signed, sealed and delivered before you make the Commerce post yours. If you can't wait to get your hands on the Senate version of the Stimulus bill....here you go. Here's a link to the 431-page bill....that's 216 fewer pages than the House version. Happy reading!